Every year before a few months before Christmas, the search begins for a new and special Christmas decoration. It’s been a tradition since I started decorating my own home for the holidays. When my daughter was born, handmade crafts, from stockings to advent Santas became my favorites. As she got older, treasures she made in school were added to the collection. It is still a special way to anticipate Christmas and its season. Do you do the same? Do you find you change your favorites over the years? For me it was Santa Claus characters for several years, then snowmen. Now it’s reindeer or actually anything deer, moose, or elk related. Some years I prefer all natural, then others cute rules. Nearly every year is old fashioned. When I saw the selection here my only problem was deciding which to select. Reindeer? Yes. Snowmen? Lots. 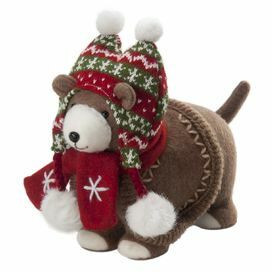 Birds, dogs, bears, sleighs…they are only the beginning. Sometimes keeping is simple suits me. Don’t pillows do a great job of that? You can find darling pillows in Christmas colors, with Christmas sayings, all sorts to suit every taste. What is nice about the idea is the ease with which you can switch them out season to season. Fall colors, Christmas, Valentine’s, Easter, summertime colors, all can be stored in a bin or two for use year after year. Themed stockings are another fun way to change out the look. Pick red and green, or go for something totally unique, like the tan ones pictured below. They lend a trendy flair that can be dressed up or down. Continue the theme with a tree skirt in similar shades, along with ribbon and bows on the tree. Candleholders, baskets—preferably filled with something fun—boxes, all can brighten the decor. It’s funny, even while I’ve thinned so much to live more simply, Christmas decorations are something I still hold onto for the memory and the tradition. Sure I finally tossed some of the broken treasures, but for the most part, each decoration holds a Christmas remembered when the whole family was living and together to celebrate. That sort of thing requires a special space. I hope you have a sweet tradition that you share with your children. It pleases me to know that my daughter now has begun her own collection. Which is another reason to peruse the variety here. 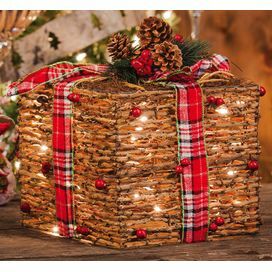 Decorations like these are wonderful gifts for friends, teachers, business associates, party hostess, and family members. I love giving a gift that will be used for years. Each time the recipient takes it out for the holidays, they will have memories too. In past years we would search for gifts to bring to an office staff. Candy was the usual favorite, but more and more people are trying to avoid that. 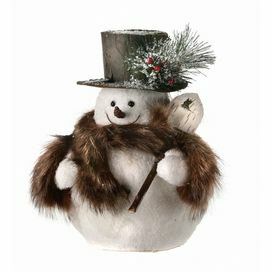 A cute snowman or a charming (and useful) basket, is something that can cheer up the entire office. Whether modern or old fashioned, it seems everyone loves to decorate. Check out the beautiful selection here. You’ll find something for every taste.